Ah yes…the routine that is my insanity…aka how I write my books. This is probably one of the most frequently asked questions of an author. I’m not sure how others go about it, but I can give you a little insight into my system. With three kids, time can sometimes be a luxury that's in short supply. The bulk of my writing happens during the school year. I’m at my computer from 7:30 am to 3:30 pm Monday through Friday. I try to keep my evenings opened- and by “opened”, I mean available to cart a child to sports practice or actually purchase groceries so I can avoid the “I’m starving” chants. At any given moment, if you were to peruse my desk, you would find many a caffeinated beverage. I try to keep one on standby as no one has yet to insert my coffee IV. Could I say a huge thank you to whomever the genius was that came up with Kickstart? So tasty! I’m also a huge supporter of the Coca Cola Company; going so far as to stash a can or three in the drawers of my desk, in case of an emergency caffeine shortage. I write in segments. Inspiration will find me, (via music most often.) With my ear buds in to drown out the world, a scene will form in my mind. Instead of fighting it by saying “That shouldn’t happen here!” I write it out how I see it. I do this for the entire story... forming myself a nice little collection of puzzle pieces. I’ve learned that at some point down the road, they will form some sort of cohesive story, and when I reach that point, I begin to put the story in order, adding in the missing plot between one section of the novel and another. One of the most interesting (translated: strange) things I do while writing? I act out the scenes. Yes- I have been spotted dancing by myself in my living room. I’ve been pointed at in the kitchen because I have pencils in each hand as I battle a villain apparently no one else can see. I talk aloud the entire time, using either my digital voice recorder or cell phone to recite all my movements. Why must I do this, you ask me? I want to feel breathless like my character after a fight. I want to know how quickly their heart beats as they strike down the creature that threatens them. I can sometimes close my eyes as I dance (with no one) and get a better sense of what Maggie or Luc or Michel is feeling as they sway with the music. Okay…yes…I may be bordering on insane at this point, but if I can experience the emotions of my characters, I can better write them to share with the readers, and that's the ultimate goal of any author. We want- we crave- for those holding our books in their hands to feel the love. We want readers to cry when our characters do, to grow enraged alongside them. You can rest assured that if Maggie is nervous and biting her lip, I was doing exactly the same while writing that part of the tale. Not on purpose, (ok…sometimes on purpose,) I end my books with cliffhangers. As I write, there comes a point when you just know it has to end. You sense it when you’re watching a film in the theater- the music is growing ominous…the lead actor is peeking around the corner even as you sit there, screaming for them to run away before they get murdered. It’s like when I write, (with less hatchet or chainsaw.) It’s just a sensation I get that this is the point to stop. It has been my experience that there are a few really awesome gifts you can give an author: a great thesaurus, a year's supply of coffee, but the absolute best gift you can give an author costs nothing but a few minutes of time: writing a quick review of their book. Speaking as an author myself, I can personally tell you that it is not only time consuming to promote a book you've written- time that is taken away from actually writing, and this isn't JUST indie or self published authors- NY Times bestsellers also have to devote time to spreading the word about their books; but it can also become rather costly, too. Developing graphics to help catch a readers eye, paying for promotional items or tours or ads... it all adds up. Reviews are read by others curious about a potential book purchase. If they read how much a person loved or loathed a book, it really does make a difference in whether or not they take a chance on it themselves. Reviews are also crucial to authors who want to hone their craft. I have yet to meet an author who doesn't have a legitimate desire to give readers the very best story they can; and reviews help authors do that. It's like the line in the movie Jerry Maguire- "Help me help you." So, should you wish to say "Dear Author, thank you for giving me a quick vacation, for giving me yet another world to escape to or another fictional boyfriend/girlfriend to fall in love with. Thank you for seeing me through a difficult time," you can do that via a review. On behalf of every author I know, I give you my thanks! The Gryphon Series meets Maggie Henning & The Realm month long extravaganza! How excited am I to announce this one!? Bestselling author STACEY ROURKE (The Gryphon Series) and I will be joining forces for a month long event! HOLY MOLY BATMAN! I haven’t been this excited for something since the announcement that Captain Jack Sparrow wanted to marry me! This month long event will be filled with contests, games, and HUGE prizes! HUGE, as in entire book collections, jewelry…and how many ways can I say ARC OF THE FINAL MAGGIE HENNING & THE REALM BOOK….MONTHS BEFORE IT’S RELEASE? There will be daily contests, such as book trivial and scavenger hunts, as well as week-long prize packs for larger contests like most page likes brought in and cast graphics. But if I were to tell you that there will be a HUGE interview…what would you say? Well…THAT’S WHAT I’M TELLING YOU! I don’t want to announce the two characters participating in the interview just yet, but trust me when I do say this: it will be a conversation to not be missed! Make sure you’re a fan of both our Facebook Author Pages (just click on the buttons with our names on them below) and join in The Gryphon Series meets Maggie Henning & The Realm month long event! Fandomfest 2013 is in the books. I survived, sore feet and all. I could easily go on about the issues that I saw- celebrities getting the blame for things out of their control, long lines, confusion- but I decided that if you were looking for a blog post that gave the dark side of the con, there are plenty of them out there. I chose to dwell on the positive. To begin- let me apologize! The Facebook release party for Phoenix Ashes was on the day I arrived in Louisville…after leaving my home in NY at 2:45 am and driving 14+ hours. To say I was whipped and exhausted would be like saying vodka is for cleaning windows. I’ll be looking into setting something else up at a future date and time. Ok, that’s out there. Now…to the convention! I stayed at The Galt House, a really…really nice hotel in downtown Louisville. Some of the events for FF were actually held at the Galt House. You could reach the KICC via a pedway (which is a glorified, non air conditioned hamster tube) but often I chose to just take the stroll outdoors to celeb stalk-, err…take in the glorious views of the downtown Louisville area. By far, the most dapper dressed man at FF was Lou Temple. With his handlebar mustache sharpened to a point that could take out an eye, that man just walked around with a brightly colored suit jacket and a smile all weekend long! Sadly, I was far to chicken to even say hello to him. I did learn, however, that my youngest daughter Haley has no shame whatsoever! That kid…she walked from the hotel via the pedway to the convention…with IRON E. SINGLETON- T-DOG ON THE WALKING DEAD! Me? I would have hidden my face and walked a few steps behind him! She talked to him about the show, about my books, about the trip… and to his credit; he was king and chatted with her! She is FEARLESS! Except for John Barrowman. He was also staying at The Galt House (as were most of the celebrities in attendance.) Thursday, after our arrival, I sat out front and watched Mr. Barrowman stroll on past…and I said nothing. I was incapable of rendering speech, frankly, and instead, I stared, slack jawed with my little country girl shining on through. I told Haley about it when she joined me (she is a HUGE Doctor Who and Torchwood fan) and she was also rendered speechless. We chose instead, to have ourselves a fit of star struck giggles. Very classy. She wouldn’t repeat that error the rest of the trip. Saturday was two more panels for me, including the Game of Thrones panel, moderated by the COOLEST chick I have ever had the privilege to meet- LEE MARTINDALE! She was outstanding and made ME look good- a task few ever manage to accomplish! My uber cool 13 year old daughter, who is so awesome and she knows it, and who had teased her sister and I for freezing up when Barrowman walked past? Yeah- she learned her lesson that teasing is mean! She had her photo taken with14 year old Chandler Riggs (Carl Grimes- TWD) Riggs had seen her in the ender area and tried to talk to her. Guess what? Cool chick that she is? She totes FROZE, too! Then, during the photo session, when he tried to talk to her again? Yup…she froze. Not so funny now, is it child? The lines and crowds on Saturday made navigating the venue near impossible. The autograph line for Norman Reedus alone was hundreds of people long- yes…I said hundreds. Saturday evening, I was lucky enough to hang out with Jennifer Malone Wright and her sister. We bumped into JH Glaze, too. Our plan had been to attend fellow author Amy McCorkle’s release party held at the Galt House, but Stan Lee’s panel ran long. JMW & I, along with her sister and my husband, opted to take a stroll out in Louisville to grab some drinks and a bite to eat. During our excursion, I learned a few things. 1. No matter how many alcoholic beverages I may consume, I am still unable to shoot webs like Spider Man from my wrists, even when pointed at a church van while I’m crossing the street. 2. Not every Irish Pub plays Irish music. Some go with extremely loud rap and dance music. 3. Michael Rooker is a great guy to run into on the street when you’ve had waaaay too much to drink. 4. I live in New York, but had never realized how awesome Long Island Iced Teas was… better yet, how delish 3 of them are. 5. Not every man in a top hat is Abe Lincoln. Sunday morning was spectacular (after my headache passed) I got in line for a SPF autograph because damnit, I would not be denied! When I met him, I produced the photo of my husband, son, and the pair of Saints. I explained (pointing to my husband) that that should have been ME! I asked him to sign the photo for my son (stupid parental guilt) and he even offered to get Norman Reedus (who was in the booth beside him) to sign the photo. I declined, as his line was so long I didn’t want others who’d been waiting to be upset. I asked Flannery if he’d be willing to have a photo taken with me. HE AGREED! I melted… ahhh, Sean…my dear, sweet Saint… call me? I had 3 photo ops on Sunday, beginning with THE DIXON BROTHERS from TWD (Norman Reedus and Michael Rooker.) Ok…yes- I did get a photo on the street with JMW and Rooker Saturday night, but we really wanted a rather sober one, just to prove it happened and we could savor the memory for…like…ever. How did the op go? Well, JMW and I entered the photo area and what fell out of my mouth? “Ummm…I am so sorry about last night…” Smooth Lisa…really smooth. Norman Reedus asked what happened last night and I let him know that we *may* have accosted Rooker on the street. Yeah…Rooker remembered. Even in spite of his memory of the evening before, I had me a Dixon Brother sammich! I may never wash that shirt again… And yes- I WILL milk those 30 seconds until the day I die. I think the coolest part of Fandomfest was celebrity watching. Jason Momoa just walking around the hotel…Michael Rooker taking a late night constitutional around Louisville…my word! They REALLY are just like you and me! Well, except for Momoa- that dude is HUGE and scary! Security was super tight Sunday as Gene Simmons (of KISS) had joined FF, but it was still an excellent day. The FandomFest experience was spectacular. Yes- there were venue issue, confusion, lack of maps, etc…but this family/work trip was so very worth it. My kids are still beaming and will now carry the memory of this trip with them forever. If I ever questioned the hard work that goes into being an author was worth it- this weekend, seeing how happy my kids were and having the chance for them to experience these events and chat with these celebrities that would never have happened had I not written a few books- put that debate to bed. I bet you guys do it, too. Make lists and plans- things you want to do better? For me, it was blogging. Blogging works so much better when you have internet that doesn't blink in and out like the Ferris Wheel lights at Satan's Circus. So, here I go..trying again, with the hopes that the interwebs fairy continues to smile on me. The lack of reliability recently to my www had me thinking- what did we do prior to the plethora of available technology we have today? This should be easy- good grief, I'm older than the Internet! But then...I realized how much I depend on it every single day. Social media that has let me connect with you guys, emails I get instead of running to the mailbox in hopes I got a letter, (ok...I still do that, but they mostly come with stamps that say "overdue" or "final notice" in bright red ink.) Even phone calls & coffee dates with the Gal Pals have taken a back seat to texting the latest "OMG! Did you hear what Lisa did?" gossip. I now plan almost everything around the World Wide Web- shopping lists, recipes, the kid's calendars... even family vacations take into account if the hotel has free wifi. While it has lead to a decline in face time (unless you have the app for that) with real human beings with the potential to spread their germs and illness to you, there are advantages, too. Heck- I even recall a time when my Mom had to yell up the stairs to tell me dinner was ready. Now, when the Hamburger Helper is plated, I Skype the kids and tell them it's feeding time on the Ranch! Seriously- Words With Friends used to be called Scrabble, and you had tiny wood pieces with letters that you had to manually place on a heavy cardboard playing field, and Farmville was actually called Manual Labor in rural areas. If you wanted the special pink sheep, you had to find safe, non-toxic paint to get one. In any event- I love technology. It has its uses, but let us not forget that there really was a world where we handed each other photographs to look at instead of Instagram, and the idea of a pretty picture of your Steak Tar Tar being shared would have left people thinking you were crazy. In an attempt to give a little information, I thought that I'd offer up some character creation insight into the folks who occupy my brain and writing. I’ll post about a different one each week. For the first one, I left it up to my 12 year old daughter to choose, and like so many others, she chose Luc. Join me as I attempt to delve into this complex soul and by far, my favorite character to write. When Luc first arrived, he was intended to be a counter balance to Michel. Michel was sweet, gentle; he had Maggie’s best intentions at heart. He seemed to be willing to do anything and everything he could to keep Maggie safe and protected. As a character that appeared so selfless, I felt the need to offer up a darker version of this Prince. When I think of Luc, I see a guy who hides, or tries to hide, his emotions deep inside himself. He sees emotions as a weakness, something that could be used against him and those he cares for. And as a soldier, that would be the right thing to do…one would think. But like a cancer, those emotions begin to eat at him. I like to think of Luc as a reluctant hero. In book one, he wants to see his brother and Maggie happy, really happy, but that is in opposition to what he wants. It takes a strong man to set aside his feelings for the good of another. Luc does just that. At the end of book 1, we finally get to hear Luc utter those words he has bit back on. He sets off to do what he thinks will make Maggie happy, again setting aside his feelings. But how long can someone disregard their own feelings? How strong can one soul really be? I see a ton of growth in Luc. Once he sets his emotions free and accepts what Destiny has given him, he cherishes it…and he will fight to his last ounce of energy is taken from him, to protect it. Luc is fierce, determined, sarcastic, and...in love. It is my honor to write this character, who has grown beyond that snide sibling in book one. I want to thank those of you who joined me at the Stephanie Meyer Fan page on Facebook last week! WOW!! It was so much fun! I really loved spending the week over there…giving away tons of swag to winners from all over the planet. Humbling and honored- that is how I feel. If you hadn’t heard yet- both Phoenix Rising AND Phoenix Burning are getting new covers!! The fabulous Brandy Martin has been working so hard on bringing the vision in my books to life and wow, has she captured it! “But Lisa,” you ask. “I already have the book with the other cover?” I know…I know. And thank you so much for that! These new covers are stunning! 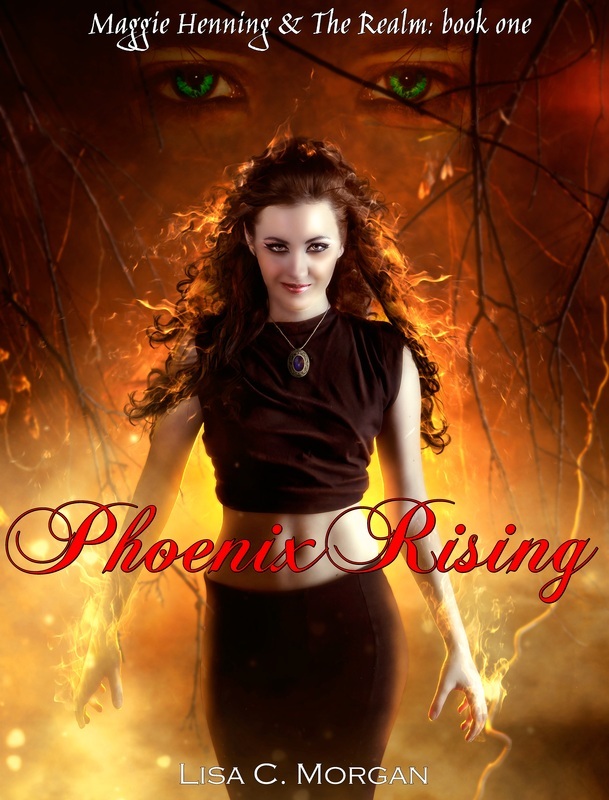 Phoenix Rising’s new cover is being revealed today! It is my pleasure to include the never before read chapter in the new cover version! I hope you will as well! Okay Peeps…time for me to head out for now! Let me know what you think of the new cover? The holidaze, with 3 kids, tends to get a little busy and leaves me rather scatter brained. Between hanging the holly, making out under the mistletoe, wrapping the wonders and then throwing in a fantastic feast for the family (that was a tongue twister and I didn't even say it aloud) I found myself with roughly 20 entire minutes to breathe. But- the new year is here, and with it, new days! Busy days, yes, but at least they're new, right? I mean really- who wants another washed up Monday? So what's been up? Well, I finished a little story I like to call Maggie Henning & The Realm book 4- Phoenix Ashes, if you're interested! Ok...yeah, I know- you have either just found me, only read book one or possibly book 2 and the novella...what do you mean FOUR? Did I miss something? No, you didn't. And no, although I am Math Challenged, book 3 has been finished for awhile now and is with editors. The *plan* is to get that out in March, book 4 in early July, and then *sob* wrap up the series in November or December. I know...I know...but everything has to end sometime, right? Anywho... how was your holiday? Did Santa bring you anything awesome (or anything with a receipt to exchange for awesome?) This year, I am starting the think there may have been a theme to my gifts the cookie gobbling over stuffed elf deposited under my tree. BBQ Sauce, Walking Dead t shirts, and a pair of Katanas! The theme- Zombie Apocalypse Preparedness. I will now have the proper attire, the proper weapon, and sauce to slather over my tasteless white rice that I will be forced to sustain myself with. It beats that episode of season three of my (he doesn't know it yet husband Daryl Dixon's) show The Walking Dead where Carl was two seconds away from spooning in the dog chow, right? This week (in more news that actually related to my writing) I am on the Author's Corner on the Stephanie Meyer Facebook page! There will be three trivia questions per day- 2 related to my books and one unrelated (to give folks who haven't read them yet a chance to score free copies!) There will also be caption contests! I've put together some neato swag to give away that I think y'all will like. In addition- all week long to welcome the new Likes to my author page, I'll be doing random "pop up" giveaways, too! Make sure you check in on either page for a chance to win! Well...I suppose I should now move on and either (1) wash dishes, or (2) write... SURVEY SAYS? yeah...I'll be writing...who needs to cook anyway? until next time my fine friends- keep on rockin', shockin', and something else that rhymes with either of those words! Alrighty then. Today, my youngest celebrates her 12th birthday...which translates to one more year before all of them are teenagers. While my oldest enjoys video games and playing his bass, and the middle child..well...she enjoys just about everything- my "baby girl"..she is ALL MINE! I'm taking her with me to UtopYA in June. I'd thought about getting a display table, some place where I could put out my books and what swag i had, for passersby to browse, to ask questions. And while I fully understand that by attending as a fan probably won't help my career any, I think it is far more important to go "BookOut" as my baby calls it. She's looking forward to breathing the same air as some of her favorite authors. How cool is that? I think we, authors that is, adore any fans we have. We love hearing that folks read our books- bonus points to those who loved them. We all began as readers. Maybe there was a particular genre we gravitated toward? An author that caught our attention from page one? I see this sort of excitement on my Monkey's face when she talks about UtopYA. She has even begun writing her own fanfiction! That is AWESOME! So, if you'll be in Nashville in June, be on the lookout for me and an extremely tall 12 year old who will probably be oogling all the great books. But...be not alarmed- she is merely a rabid fan! If you notice her- make sure to give her a quick wave, or a "Hello Monkey!" You'll make her day! Until next time- HAPPY READING! !